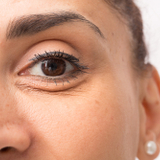 There has been a rise in the popularity of plasma devices for the treatment of the periorbital area in recent years.1 In my experience, the use of plasma for the treatment of periorbital rhytides or eyelid laxity has proven remarkably successful. However, when it comes to plasma treatment, like the saying goes ‘beauty is pain’ as the procedure itself can be uncomfortable and the aftercare is often lengthy, with swelling and crusting featuring as part of the healing process. Currently, most practitioners use topical anaesthetic gels to reduce intra-operative pain in plasma treatment. Even with the use of topical anaesthetic creams and gels – those that I have trialled range from 4% to 24% lidocaine – the procedure can still be intensely unpleasant for the patient. With this in mind, I felt there was a need to introduce a more comfortable alternative hence the introduction of my anaesthesia protocol, which has been modified from an existing technique, for injecting anaesthesia when performing plasma treatments. 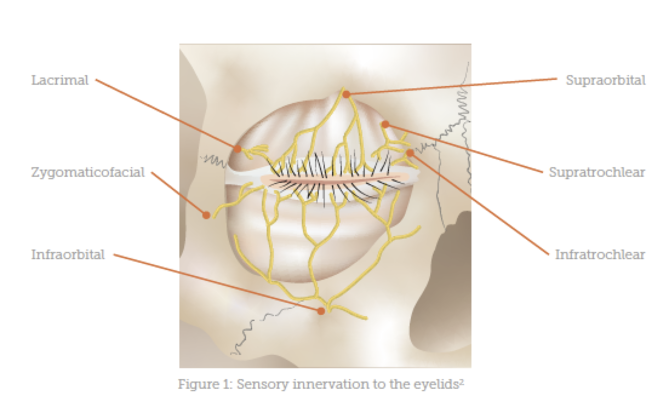 In order to achieve pain control, it is important to consider the sensory innervation of the eyelids. Unfortunately, a single point injection will not anaesthetise the entire area, so I sought a technique utilising multiple but easily accessible sites, which I discuss later. Infiltration anaesthesia is almost instant, and due to this you can start work on the area immediately, as opposed to the 30-40 minutes expected with numbing gel. To start, I mark the treatment area with a surgical pen or marker. This is important as the anaesthetic will distort the tissues, making the proposed treatment area less distinct. I prefer the use of a wider bore cannula for the placement of anaesthetic sub-dermally, either a 25 gauge or a 22 gauge; this not only facilitates blunt dissection through the tissues but is for safety – the area around the eye is delicate and I prefer to minimise the risk of vessel trauma. The first point is the lateral cheek. This lets me access the lower eyelid in its entirety, anaesthetising the branches of the infraorbital and zygomaticofacial nerves and thus the sensory innervation to the lower eyelid with ease (see Figure 2). Anaesthetic can be delivered in this way continually to increase patient comfort. A further option to achieve anaesthesia to the lower lid would be to deliver an infra-orbital block (either through the cheek or intra-orally), but this does not anaesthetise the lateral part of the lower eyelid; I have found that access to the lower lid via the lateral cheek point results in better anaesthesia for this treatment. 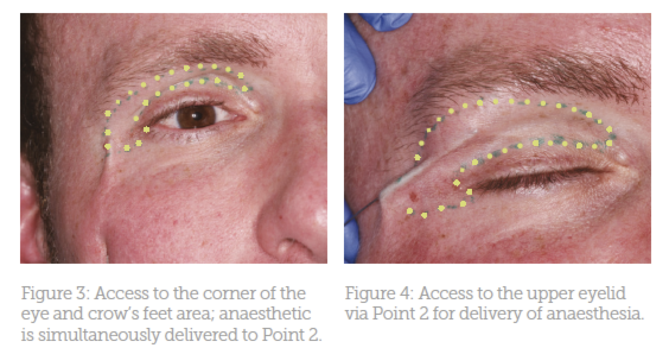 From Point 1, I access the lateral part of the eye to the tip of the brow in a fanning pattern in order to distribute further anaesthetic to the lateral canthal rhytides and Point 2 (Figure 3 & 4). The second access point is lateral to the outer canthus of the eye, lateral to the bony margin of the orbit. At this stage, the area is already numb from the previous point of entry, and patient comfort is ensured. The tissue is lifted in order to introduce the priming needle. In this area, there is an enhanced risk of bruising, and indeed in patients with very delicate tissue, haematomas can be observed. 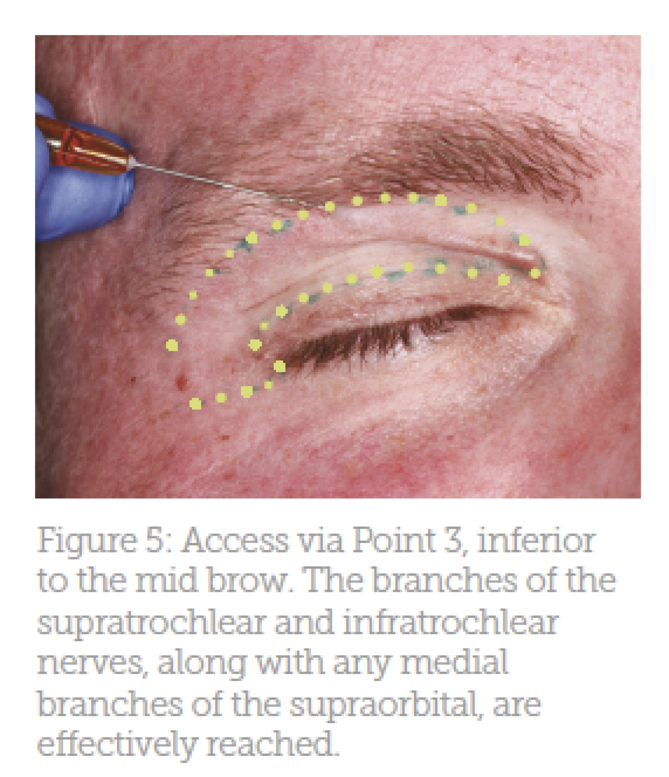 Access from Point 2 is with the intention of anaesthetising the lateral aspect of the upper lid; the cannula can be advanced gently from this point by pulling the tissue taut with the other hand and guiding the cannula. Force is not required, and the cannula should move freely under the skin of the upper lid. The patient may report slight stinging with the introduction of the anaesthetic, but otherwise the procedure is painless. The majority of the eyelid can be anaesthetised from this point and the lacrimal and supraorbital nerves are easily anaesthetised. The third and final entry point is inferior to the mid-point of the brow (Figure 5). From here, the medial part of the upper eyelid can be reached and infiltrated, allowing complete anaesthesia of the upper lid. The three points of entry and subsequent infiltration of anaesthetic can be rapidly undertaken; I perform this procedure in around three to five minutes depending on the patient – the more nervous the individual, the more time it will take. However, patients accept it readily and whilst many describe the feeling as ‘odd’, it makes the subsequent treatment virtually painless. Between 2-3ml per side is usually sufficient to fully anaesthetise both upper and lower eyelids, including crow’s feet areas. I find that the anaesthesia is profound within three to five minutes and short-acting, and mepivacaine hydrochloride has no adverse effects locally.4 The period of anaesthesia is around 20-30 minutes. It is for this reason that I anaesthetise one eye and treat it immediately, followed by anaesthesia and treatment of the second, as the period of anaesthesia is not long enough for both eyes to be treated. With anaesthesia, the eyelid becomes droopy and heavy. With 3% mepivacaine hydrochloride anaesthesia is so short acting that patients find that their eyelid recovers often before they leave the practice. There are no concerns over patients making their way home if they have control over the movement of their lids and I find it is well tolerated. The patient will experience a little pain on infiltration of the anaesthetic, a slight stinging sensation which lasts only a few seconds. It is important to inject slowly to minimise pain. There is no doubt that injection of anaesthetic will cause more swelling around the treatment site. Plasma treatment already has the propensity to cause significant swelling post-operatively, and I counsel my patients regarding this. In order to minimise swelling, I prescribe a short course of prednisolone to my patients – 10mg (two 5mg tablets) taken once for three days goes a significant way to reducing post-operative swelling from both the procedure and the anaesthetic delivery without significant systemic effects. Patients may furthermore cool the treatment site, sleep with their head elevated, and some report that additional use of non-steroidal anti-inflammatories additionally alleviates both swelling and post-operative discomfort from swelling and tissue trauma. There is risk of bruising due to the delicate nature of the periorbital tissues and if bruises occur, application of pressure is usually sufficient to control this. Bruising resolves within the time it takes for the treatment sites to heal and they are usually self-limiting. Patients should be coached regarding the possibility of bruising as part of their consent process. I have used this method of anaesthesia of the eyelid in well over 100 treatments thus far and have had positive outcomes. 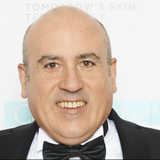 In my patients receiving plasma eye lifts, I find that multiple sessions are required for best results. My method for anaesthesia is well tolerated and allows my patients to return for their second and often third treatment sessions without the fear of pain. I find that infiltration anaesthesia has revolutionised my approach to plasma treatment and my patients tolerate it well. There is no doubt that the application of a topical anaesthetic is technically less demanding than infiltrating the periorbital tissues with anaesthetic. This method will not be suitable for everyone, and whilst this article may serve as a guide, there will be practitioners who will benefit from further explanation and hands-on training. Care in exploring this technique has meant that I can give my patients a comfortable and relatively painless treatment experience. As aesthetic practitioners, we should be versed in the use of cannulas, so the administration of anaesthetic rather than filler should not strike fear into our hearts. At a time when we should be working on our skills to improve patient satisfaction, this has made a significant difference to my practice. Scarano A et al, ‘Treatment of perioral rhytides with voltaic arc dermoabrasion’, European Journal of Inflammation, 10 (2012), p.25-29. Tyers, A.G. and J.R.O. Collin, Colour Atlas of Ophthalmic Plastic Surgery E-Book. Elsevier Publishing, 2017. 4th Ed. Trapasso, M. and A. Veneroso, Local anesthesia for surgical procedures of the upper eyelid using filling cannula: our technique. Plast Reconstr Surg Glob Open, 2014. 2(5): p. e143. Septodont, Scandonest 3% Plain Patient Information Leaflet. 2011. Brockmann, W.G., Mepivacaine: a closer look at its properties and current utility. General Dentistry, 2014. p.70-75.